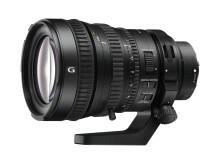 Now Sony offers photographers and movie-makers a potent new creative tool: the first ever full-frame powered zoom lens for the α E-mount camera system. Designed and engineered to uncompromising standards, the FE PZ 28-135mm F4 G OSS (SELP28135G) offers videographers and film-makers immense expressive power. It’s an ideal partner for cameras such as the 35mm full-frame α7S, capturing immense amounts of flawless detail whether you’re shooting 4K video, Full HD or stills. The SELP28135G is compatible with all Sony E-mount cameras and camcorders. Its focal length extends over an even wider 42-202.5mm (35mm equivalent) range when attached to bodies with an APS-C sensor like Sony’s α6000/α5100 cameras as well as pro-friendly Super 35mm format camcorders like the NEX-FS700 or new PXW-FS7. A constant F4 maximum aperture lets movie-makers and still photographers achieve beautiful depth of field effects and stable exposure control across the entire zoom range, from wide-angle to telephoto. 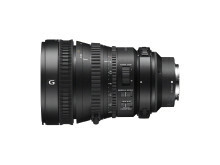 The needs of serious film-makers are catered for with Sony’s new ‘Smooth Motion Optics’ design philosophy. Targeting the highest possible image quality when using large-sensor cameras, this advanced optical/mechanical design addresses three issues of prime concern to movie-makers: change in angle of view (‘breathing’) while focusing, focus shifts during zoom and movement of the optical axis during zoom. In addition, aspherical lens elements suppress unwanted aberration while advanced multi-coating technology boosts contrast and cuts glare, even with strongly backlit scenes. Handling and ergonomics of the SELP28135G are indebted to Sony’s professional cameras for broadcasters and film-makers. Three separate rings offer independent control over focus, zoom and aperture (iris), with optimal torque for a satisfyingly responsive, professional feel. Even the pitch of scalloping on the rings has been painstakingly designed for comfortable, slip-free fingertip control. Powered by the SSM drive, in an industry first, zoom is exceptionally smooth and silent – a must for professional movie production. Zooming speed can be precisely controlled over a wide range, with the ability to switch zoom rotation direction as desired to suit personal preference[i]. Focus noise is also minimised by reducing the weight of the focus element group and driving with a responsive double linear motor. As an extra refinement, focusing mode can be switched effortlessly from auto to manual simply by sliding the focus ring, without fumbling to find a focus mode switch mid-shot. Premium optical performance and operability are complemented by a dust and moisture-resistant design, making the lens ideal for location use. Extra versatility is afforded by Optical SteadyShot that provides in-lens image stabilisation during handheld shooting. Despite its heavyweight credentials, the lens’s compact dimensions and reduced weight are especially welcome in shooting situations where maximum mobility is needed. 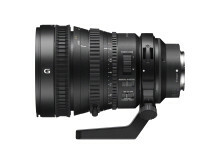 The FE PZ 28-135mm F4 G OSS (SELP28135G) full-frame power zoom lens for professional photographers and movie-makers is available to pre-order now from www.sony.co.uk.